Women often report pelvic floor problems after childbirth. But men have a pelvic floor too (of course) and sometimes it needs special attention in yoga. My friend John, a regular guest at Griffins Hill, was diagnosed with prostate cancer shortly after his Easter holidays a year or two ago. John's a private person, but he kindly agreed for me to write about his experience so he could help other men who might be suffering in silence and might be inspired by his recovery. His cancer diagnosis was not a complete surprise. He'd had a bit of a scare 12 years ago, so his urologist (a specialist in men's urinary tract and prostate) recommended monitoring his PSA levels (prostate-specific antigens) because a rise would signal a problem. Many men have an enlarged prostate for years and even decades without problems other than some discomfort from the swelling. However, when John's PSA levels took a jump, and his prostate became swollen, a biopsy showed he had aggressive prostate cancer. It was a seven out of 10 on the scale of severity. His specialist recommended surgery. His options were few. Doing nothing was very risky, and sadly, John's wife was severely ill at the time and needed his care. Surgery was the option that allowed John the best chance of recovery and the quickest path to return to caring for his wife. I didn't catch up with John until some time after his surgery. He is a deeply curious, intelligent man and a creative and dedicated water engineer. He influenced the Victorian government to mandate dual flush toilets, reducing the average quantity of water flushed from 13 litres to four! That is very cool. With some delight, John explained to me that the operation was done using a "Da Vinci robot". "I lay with my head sloping down," he told me. "The surgeon punched five slits into my abdomen and inserted a laparoscope, surgery lights, a camera and various snippers, cutters and pliers. He then sat at a table beside me with eyepieces allowing him to see my insides in three dimensions. He had sensors attached to his fingers so he could manipulate them with much more precision, and stitch my urethra back more precisely." The operation took five hours, and John stayed in the hospital for two nights. He came home with a catheter and a urine bag which he wore for a couple of weeks. One of the side effects of removing the prostate is incontinence: being unable to control your bladder. Some patients recover their bladder control quite quickly, and some never get it back. It's a scary prospect and not one that most men ever discuss. Yet 13% of Australian men and 37% of Australian women suffer urinary incontinence, according to the Continence Foundation of Australia . To control our bladders, we need strong pelvic floor muscles. Women who have had children become instantly familiar with the pelvic floor. It's weakened by childbirth. After childbirth women can strengthen these muscles again by doing asanas that strengthen their pelvic floor muscles, starting with gentle asanas, which I will share with you shortly. Most men often don't know much about the pelvic floor until they face a health problem that strains them. However, as a yoga practitioner for quite some time, John was familiar with this set of muscles. They are the ones that stop the flow of urine midstream if you clench them. While John was willing to put up with the catheter for a week or two, he was committed to becoming continent again as soon as possible. He made use of all the resources the health system offered him to recover control quickly. He took the advice of his Continence Nurse, and of a buddy system offered by the Cancer Council. "They connect you with someone who has had the surgery," he told me. "I rang the guy, and he gave me advice. He said you could get to be largely continent, but certain situations still caused him problems. His advice was "do what you can". Being familiar with these muscles through yoga meant John was well on his way to full bladder control before he came to us. His surgeon was astonished that, within three months, John had dispensed with incontinence pads. However, he still ran into problems when moving from sitting to standing position, especially if he was tired. 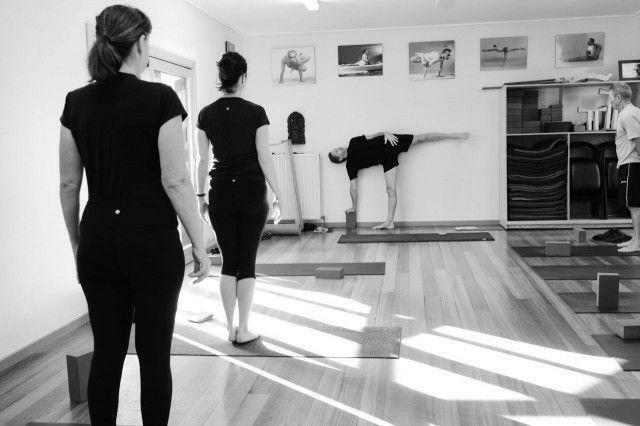 With this front of mind and determined to recover complete control, John came for an extended stay at Griffins Hill Yoga Retreat where I could provide one-on-one classes and he could attend my regular classes and retreats. I was delighted that I could help. Together we developed a whole series of postures to strengthen John's pelvic floor that I am going to share with you below. But first, let me assure you that John has recovered complete control of his bladder, and that makes a big difference to him. If you are fairly new to Iyengar yoga, remember to start with gentle postures first. If you are recovering from an recent operation then it would be best to practice the restorative poses (1,2,12,13 &14) for up to a week while recovering. If you are a regular yoga practitioner, are familiar with how to safely use props, or have a teacher who can supervise you, here's a special yoga sequence that I devised together with John to help him during his recovery after the operation. With special thanks to John for his openness, we hope that you find them valuable. Frank Jesse Supta Baddha Konasana (5-10 minutes) (reclining bound-angle pose) on a bolster with head support and support under thighs. Breathe quietly into the abdominal area observing the pelvic floor region on the inhalation and exhalation. Observe how the dome of the pelvic diaphragm follows the dome of the abdominal diaphragm. Let yourself relax completely. Frank Jesse. Extend your arms overhead in Supta Baddha Konasana. Supported Savasasana 5-10 minutes With 3 fold blanket under spine and second blanket supporting head and neck.